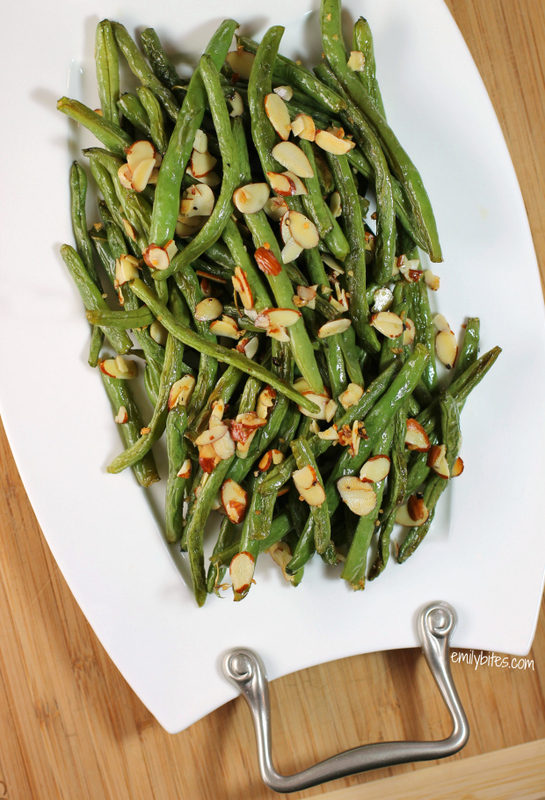 These Garlic Roasted Green Beans with Almonds are my absolute favorite new side dish. I want to eat them with everything! 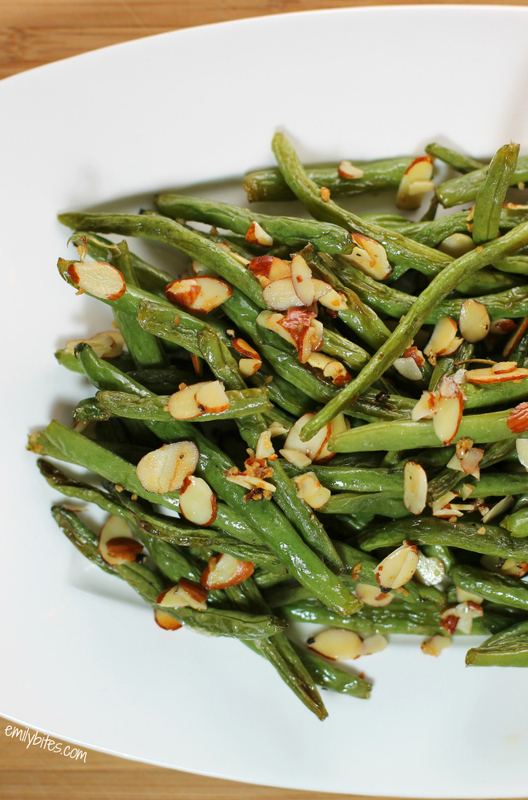 The toasty, crunchy almonds, the crisp, seasoned green beans and the golden roasted garlic are a combination you won’t be able to get enough of – plus it goes with everything! This dish is super easy to make and you could easily make a bigger batch if you’re serving it for Thanksgiving or a dinner party. It looks elegant, packs tons of flavor, and it’s healthy – what more could you ask for? Besides a way to eat as much garlic as you please and still have minty-fresh breath afterward, of course. Spread the green beans across a baking sheet in a single layer. Place the baking sheet in the oven for 15 minutes. Remove the beans from the oven and sprinkle the minced garlic and sliced almonds over top of the green beans. Stir to mix together and then spread to a single layer again. 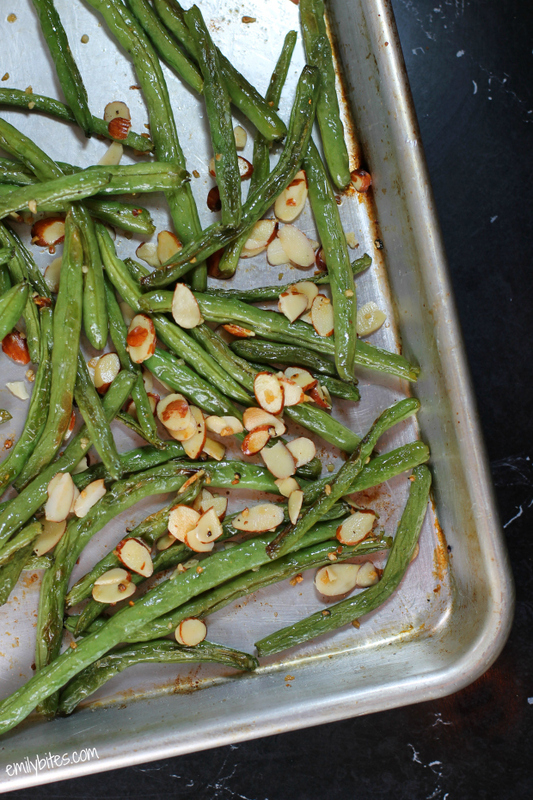 Place the baking sheet back in the oven and roast for an additional 5 minutes until green beans are cooked through and the garlic and almonds are lightly golden. I love anything roasted with garlic and these beans are no exception!! LOVE! I love almonds with green beans! I love the addition of garlic, too! You made my day!. I have been craving these green beans from a dim sum restaurant about 45 min away. I had to run to the store immediately and get the ingredients to make it with my lunch! Looks so delicious, and easy! The perfect dish for Thanksgiving! Thanks Amy! I would definitely recommend fresh, the texture of the beans will be better. If you want to try it with frozen, I’d suggest allowing them to thaw first. Let me know how it turns out! I have made a similar recipe over the yrs, using a skillet, and then an electric skillet. I usually add soy sauce to salt them up a bit. And I frequently use caned rather than fresh as a time factor. I’ve done them w french cut and ‘kitchen cut’ but I prefer the whole green beans. (which do come canned too). quick and easy to get done. I made this for Thanksgiving dinner and my family loved them. These will be a regular in our house! I just made these today (trial run) and they turned out really yummy!!! Making them again for our guests later today. Thank you for posting this great recipe!!! So glad you loved them, I hope the recipe is a hit with your guests! I made these for Thanksgiving dinner. They were a BIG HIT. I loved them, and so did everyone else! Thanks for the great recipe (and calculating the WW Points+ as well). I plan to make this great recipe for holiday meal for a party of (9). Does this recipe need to be doubled? There will be other sides as well. Ty.